More about iittala Toikka Kiuru Annual 2017 Egg The numbered iittala Toikka 2017 Annual Egg is one of only 750 laid by the Annual Bird Kiuru, which celebrates 100 years of Finnish independence. It shares the same dotted motif in blue and white, a palette that reflects the blue skies and clouds as well as the lakes and snow of Finland's landscape. Like the birds, the egg requires the skilled craftsmanship iittala's glassblowers. When the opal white glass is blown into the mold, it allows small air bubbles to form on the surface of the glass. Blue dye is added in powder form to create a pearl-like pattern under clear glass, which begs for a closer look. Please note: Blue markings will vary; some have more or less streaks or spots than others. This is due to the handcrafted nature and is not a blemish or defect.The birds and eggs of Oiva Toikka's 2017 collection are individually mouth-blown by the master glassblowers at iittala�s glassworks in Finland. 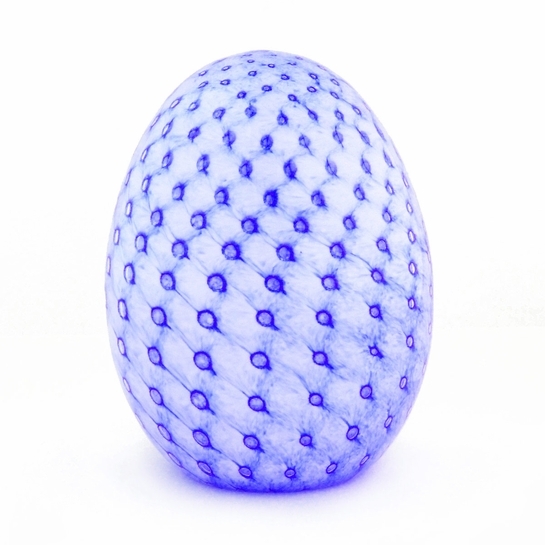 Each handcrafted iittala Toikka Kiuru Annual Egg carries the signature �O. Toikka IITTALA 2017� and is numbered x/750 on its base to ensure authenticity.